It’s that time of year again, unfortunately. We’re just a few weeks away from April 15th, a day no one really looks forward to. Well, this year it’s actually April 18th (or the 19th if you’re in Massachusetts) thanks to a Washington D.C. holiday called Emancipation Day. Anyway, most folks shouldn’t really fret about this date because the lion’s share of taxpayers will actually receive a refund. 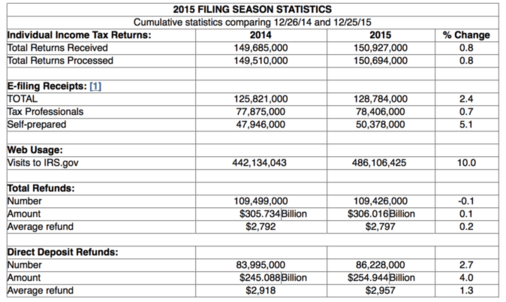 In 2015, some 109,426,000 tax refunds were doled out to taxpayers, similar to numbers seen a year earlier. And the numbers will likely be quite the same in 2016. The total amount refunded last year was just over $306 billion, with the average refund coming in at $2,797. That’s not a small amount of money by any measure, and actually pretty sizable if you consider that many individuals don’t even have $1,000 in savings. Now, if you’re one of the many millions of people that gets a tax refund in the next month or so, you might be wondering what to do with it. Perhaps you have some bills to pay, or a large purchase you want to make. Or you’re eyeballing a vacation. Maybe you’re renting and plan to use the money for a down payment. There are plenty of things you can do with thousands of dollars, some good and some not so good. One way to make that refund go even further is to invest it. This could involve putting it in a retirement account, or a personal trading account, or even a CD or basic savings account. If you’re a homeowner with a mortgage, you’ve got another option. You can apply your tax refund to your principal mortgage balance to pay it off sooner. Now this is completely voluntary and up to you and you only, but it is one option to “earn a return” on your tax refund while also reducing your mortgage balance. Put simply, when you put money toward your mortgage you’re earning a rate of return equal to the interest rate on the mortgage. That’s pretty much what banks are offering these days in terms of interest, meaning it’s probably not one of the best places to park your extra cash, despite being a no-risk investment. Instead, you could dump the refund money into your mortgage and earn that higher rate of return and also pay down your mortgage balance a bit sooner. For example, if you have a loan amount of $200,000 on a 30-year fixed set at 4% and put ~$2,800 toward the principal balance early on you’ll save about $6,300. And the mortgage will be paid off roughly nine months sooner. A lump sum approach to paying early can also save you more money than making biweekly payments or paying a little bit extra each month. Now this isn’t for everyone, but if you already have a decent amount of savings and no real plan for your tax refund, putting it toward the mortgage is certainly one option to consider. If you’re into saving money, it could be a good move, especially with other alternatives (faltering stock market, low yielding savings accounts) not looking very favorable at the moment. Just know that the money will be locked up in the home unless you sell or refinance.